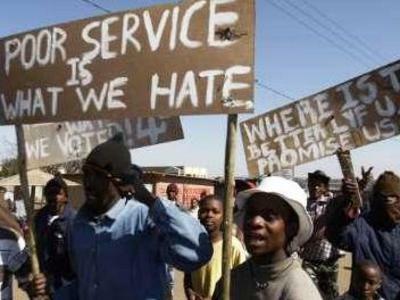 As South Africa prepares for local government elections on August 3, the just formed Coalition Against Violence (CAV) urges government to take decisive action to prevent violent protests. Leading civil society organisations formed the alliance to promote the peaceful resolution of public protests. CAV is made up of organisations working to prevent violent protests and is co-ordinated by the Centre for the Study of Violence and Reconciliation (CSVR) and the Institute for Security Studies (ISS). “We are concerned that violent protests are increasing as local government elections approach”, said Nomfundo Mogapi, CSVR executive director. “The coalition will draw attention to the trends and put pressure on government and political parties to act appropriately”. The coalition was formed following a meeting in Johannesburg earlier this month to review the state of violent protests in the country. It subsequently hosted a seminar at ISS to review local government responses to violent protests. The event outlined how government, community, business, media and civil society can help prevent protest action turning violent. “Municipalities must take applications to hold a protest seriously”, said ISS researcher Lizette Lancaster. “The right to protest, demonstrate or strike is entrenched in Section 17 of South Africa’s Constitution and this needs to be respected”. CAV will focus on addressing the triggers that increase the risk of protests turning violent. Equally important are the factors that prevent violence from breaking out in the first place. “The causes of violent protests in South Africa are complex, but that doesn’t mean protest action should be discouraged, or that appropriate responses can’t be taken to minimise the impact of violence in the weeks ahead,” Mogapi said. Research by ISS and CSVR shows a range of factors can influence whether or not protests become violent. These include the conduct of leaders, law enforcement agencies, government departments or private companies that may be the target of protests. The key question, Lancaster maintains, is why many communities feel that peaceful protests are not working to resolve their grievances. The coalition aims to promote human dignity in how government engages with communities and meets peoples’ needs. It calls on political parties to respect the Electoral Commission’s Code of Conduct. Communities must hold political representatives and their parties accountable through peaceful means and via the ballot box. “Together we will build a broad coalition to support ongoing programmes to prevent violent protests in our society,” Mogapi said. The coalition calls on South Africans to support the initiative. Krokodil Botha Its an onslaught all around. Krokodil Botha Aa & bee applies everywhere, even in the da. Cosmik Debris Stick to the subject. You're drifting off. Cosmik Debris I have. They agree.